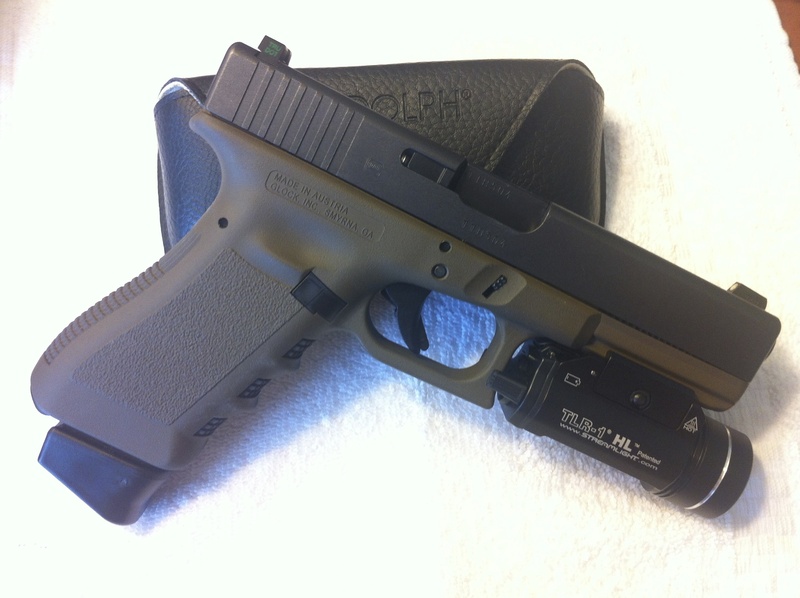 This Glock came to me in June 2013 as a standard 3rd Generation Glock 17 complete with the stock plastic sights, plain as they come. Its exact birth date I can’t recall at the moment, but sometime in 2012 is a close enough guess. I knew before I purchased it that it would go for a Cerakote paint job – Patriot Brown the chosen flavor – and the week following its arrival at my door it took a trip to Washington. 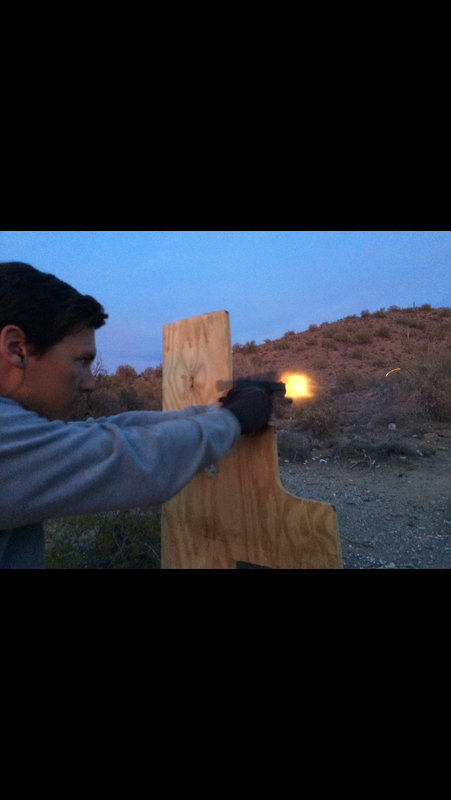 In the meantime, I took the slide to get a pair of night sights put on. I scooped the only pair I was familiar with – Meprolight TruDot – after having bought my first Glock (a Gen2 G19 that I still regret trading) with the same set attached. I would later switch sights, but they served their purpose for the time. A few weeks after sending it off (and more than a week after I was told it would be finished), the frame came back….Patriot Brown! OD Green. Now, if you’re like me and have had poor eyesight your entire life – and sometimes just flat out don’t trust your eyes – perhaps you could convince yourself that this is brown, and I tried my damnedest (yes that’s a real word). It wasn’t until the GF said “Ooooo I like the green!” that I had to sit down and do some investigating…apparently my eyes weren’t making this stuff up! 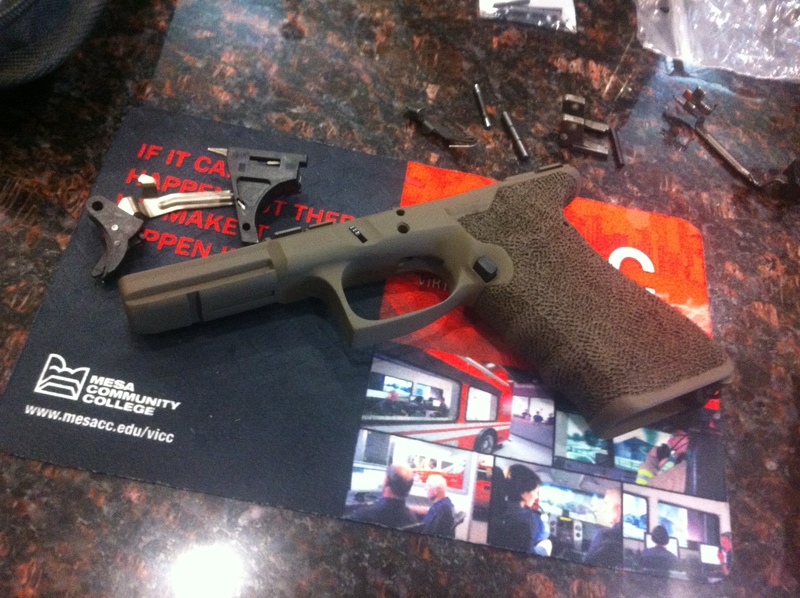 Still, it wasn’t until I met up several months later with a friend of mine who had done his own Glock frames in Patriot Brown that I had the chance for a direct comparison of the two colors. 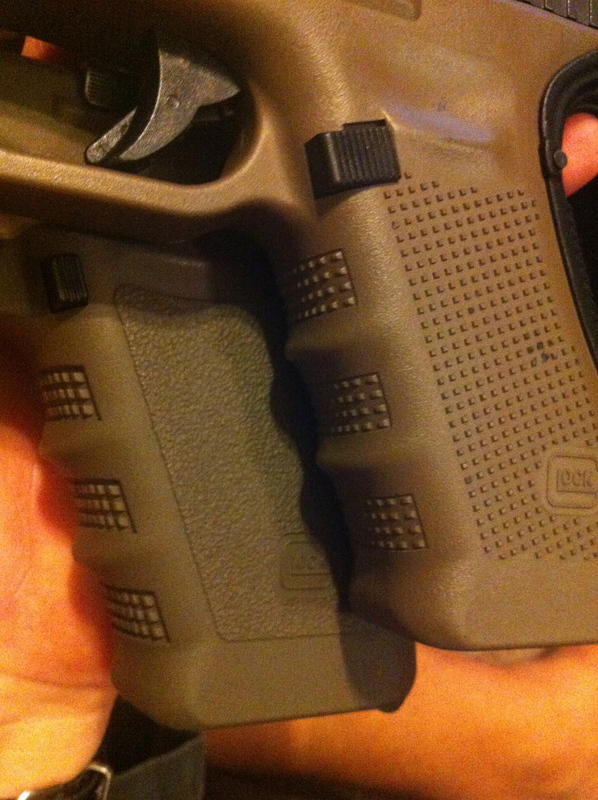 Below: (Top) Patriot Brown G19, (Bottom) My OD Green G17. As you can see, they are two distinct colors. On the bottom is my OD G17, on top the Patriot Brown G19. At this point, I had a some options. The first was to contact the gentleman who had initially done the wrong work and see if there was a remedy or refund available. I felt, however, that a refund was unlikely given I had waited several months to say anything (never mind not having had opportunity for a direct comparison during that time), and I really didn’t have the stomach to pay round-trip shipping again and not have my pistol for another 2-3 weeks, all the while hoping he understood me this time and I would have what I wanted. That coupled with the fact that my friend has the necessary equipment and paint I needed and my creeping urge to begin custom work on the frame persuaded me to cut losses and move on. I had things I wanted to do. 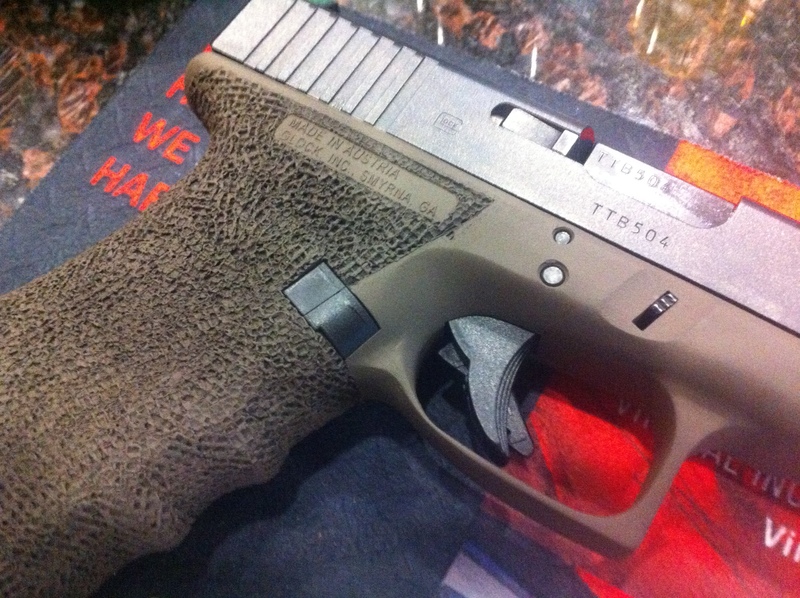 My first venture into Glock frame custom work (if you can call it that) began as a simple trigger guard undercut. 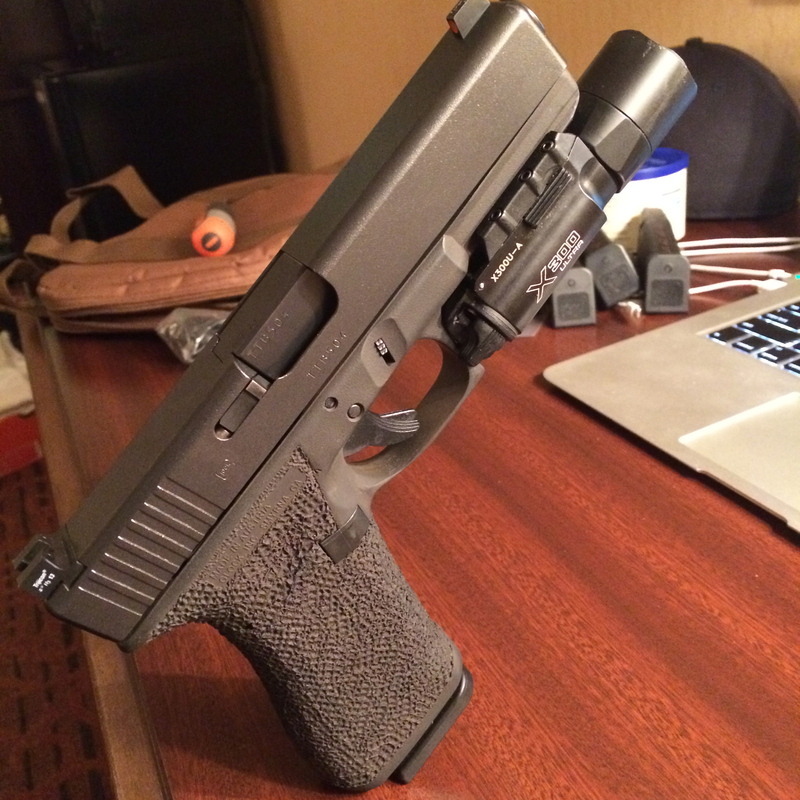 I had seen it before and felt I had no use for it, but after handling a friend’s Glock on which he had undercut the trigger guard I was sold and set to work on my own. Still, I knew I wanted to avoid the straight-into-the-frame, block-cut that many amateurs do. Whether they think it looks good or whether it just is easier, I don’t know, but I think it looks like hell. My undercut got rounded and beveled, blending as best I could the edges. Profile of the undercut. Notice the pencil marking around the mag release where I had begun toying with an release scallop. This is how it begins! 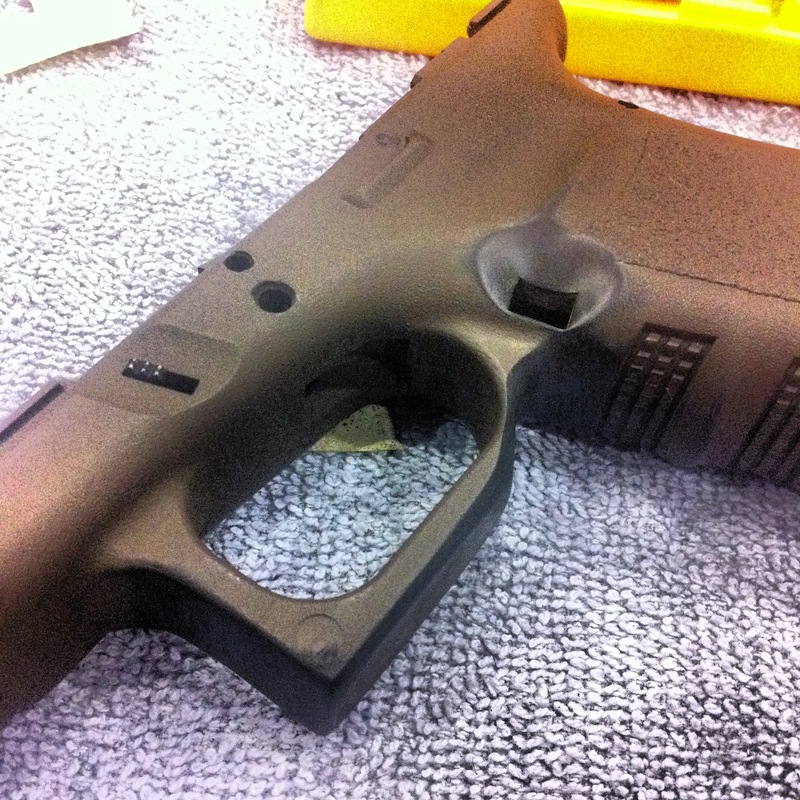 Ugly, and you can see the black showing after taking off the thin top layer of OD Green Cerakote. By now – after having hacked off a good bit of polymer from this thing, I began to get confident. I also began to look a bit closer at what the pros were doing. 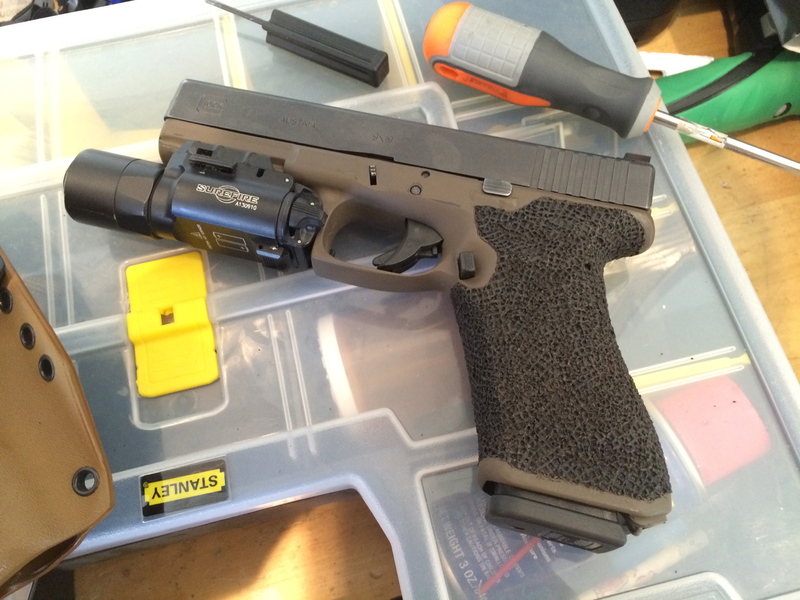 Ben at Boresight Solutions quickly became the standard I wanted and, while I wasn’t going to put $1000 into my Glock, I was going to analyze his work and try to emulate it. From this, the idea was born to bevel the magazine release as well. So, here I am, using a $10 rotary tool (my Dremel being 1200 miles away at the time; no fear!) hacking away at my $400 piece of plastic. Despite my handicaps and that I had never done any of this before, I was somewhat pleased with the result. Cut and polished. 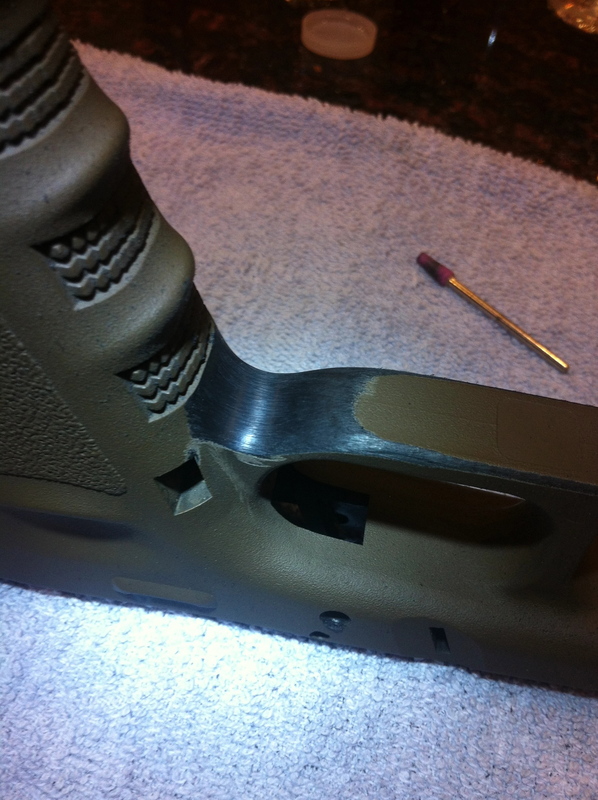 As you can see, I got a little wrapped in the project and straightened the front edge of the trigger guard. Hindsight finds me regretting it. I had a pretty good idea what I liked and disliked by this time. 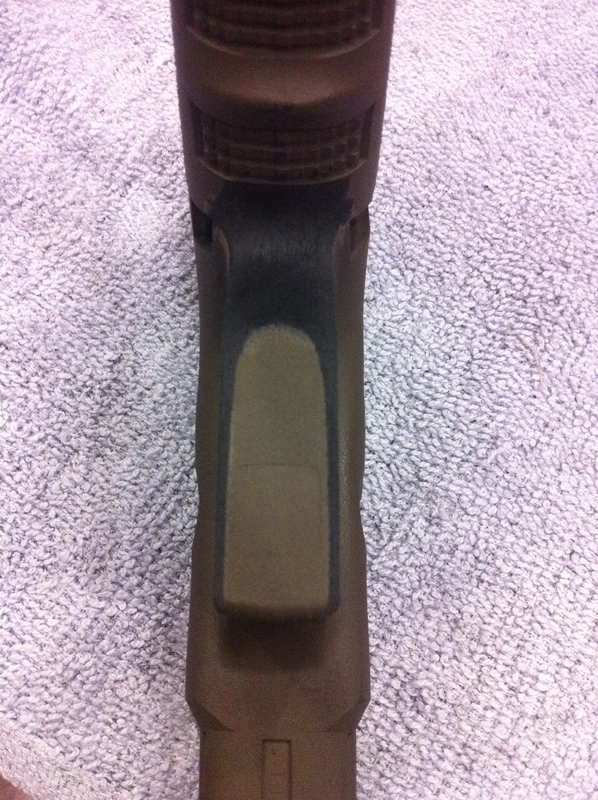 Having perused hundreds of Glock customizations, I knew that I didn’t like simple, flat-edge undercuts. I wanted thin, clean, beveled edges and contours. While the above work left me satisfied that I could do acceptable work with a rotary tool, it left me wanting more. I wasn’t going to paint it again until I got it to finished form, and that meant diving in head first and completing the undercut along the length of the trigger guard, and even stippling the frame. As it turns out, two more mistakes lay ahead for this project. The first of the last two mistakes was not sanding the frame smooth prior to laying the iron on it. This would require a bit of time and detail in removing the finger grooves (which I find all Glocks seriously wanting to do without) and making even the rest of the frame, and quite frankly I got lazy and/or in a hurry, neither of which generally being conducive to a job well done. Still, I was happy enough with it to send if off to be painted real Patriot Brown. Finished product! For a short time. Alas, there was one mistake left to come. So there she is, finished after a few months of tinkering. But she would stay this time only a short while. As with the start of this project, a friend’s work would push me a step beyond where I felt I could go. 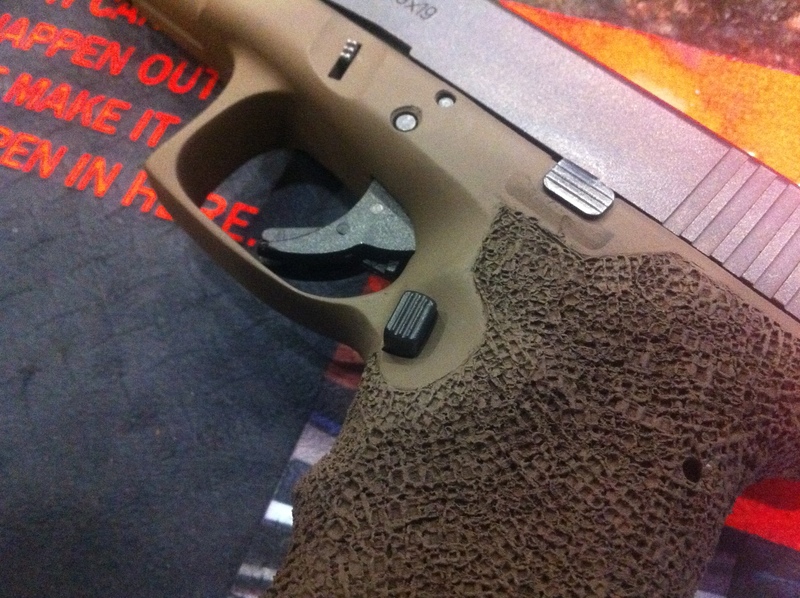 He showed me his newest Gen4, from which he had removed the finger grooves and sanded smooth the entire frame prior to stippling. That was it: the finger grooves which I had wavered about since the day I got the pistol had to go, as they should have from the first day. And this is the second of the last two mistakes. When you stipple polymer plastic, you essentially melt and raise the surface of the material, creating a raised, textured surface. Keep applying the iron to it and the height gets compounded, and quite frankly begins to look really poor. Still, after racing home after work and hacking off the grooves – revealing the base black polymer against the painted frame – I decided to make all the stipple black by applying the iron once more, if only lightly. Turns out it doesn’t work that way. In order to bring the black to the surface, a lot of heat has to be applied, creating an unsightly texture. Thankfully, a light sanding was able to knock off some width/height and retain the texture decent enough. 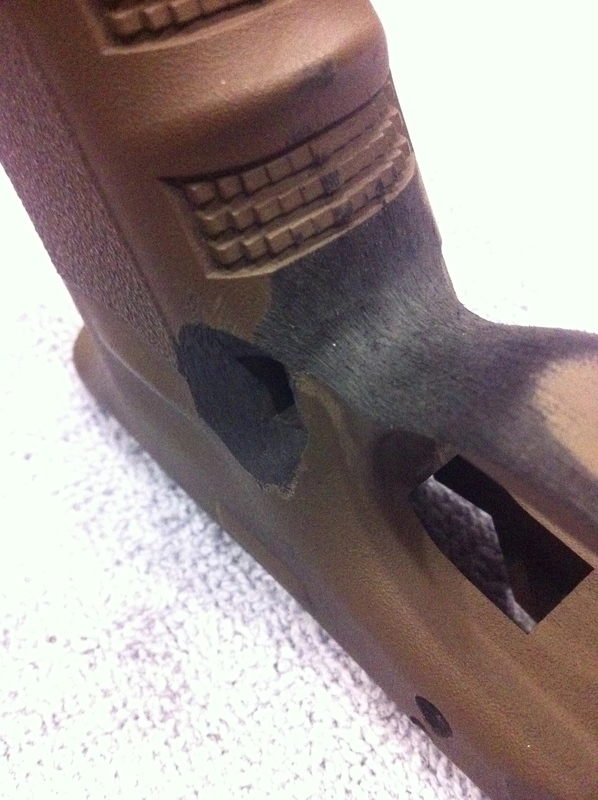 Finger grooves removed and re-stippled. I nearly screwed the pooch on this part, but was able to salvage it enough to keep myself happy. Just the same, the whole thing received a media blast to clear the old color away in preparation for a new coat…that never came. I came to like the beat-up gray that was left over following the blasting, leaving slight traces of Patriot Brown and, yes, even the OD Green that started this whole mess. 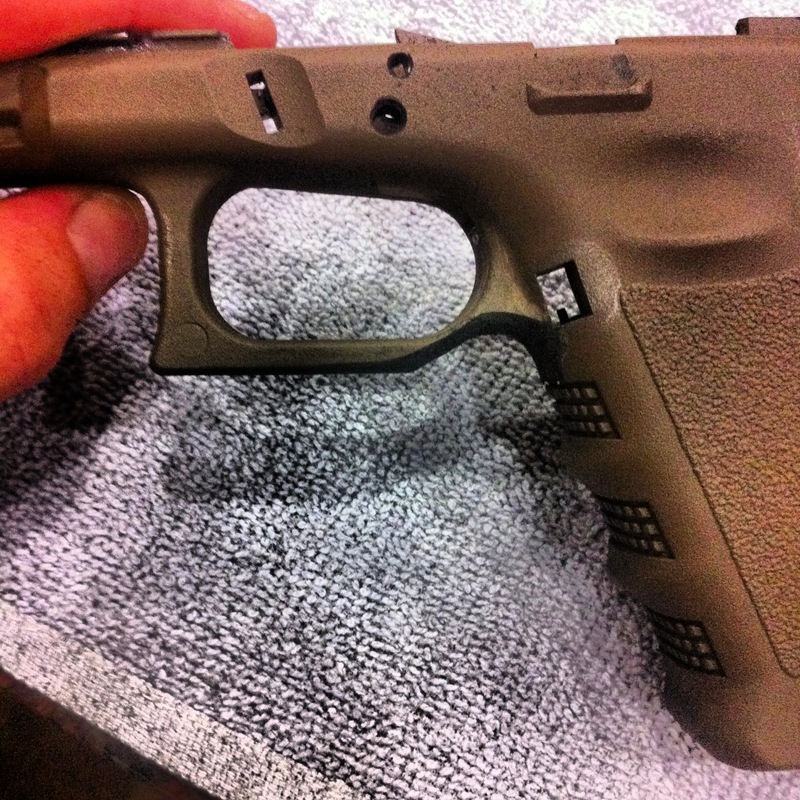 Hell, it’s a Glock: you can’t make ’em pretty, just less ugly. As it stands now. Undercut, beveled, stippled, hacked, beat, and blasted. Great as ever. 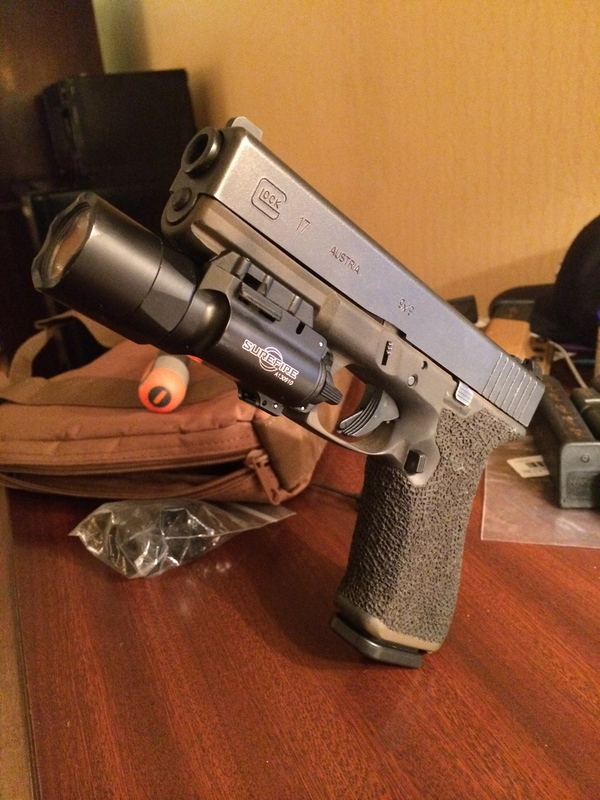 Trijicon HD Night Sights – replaced the Meprolight TruDot sights I had put on when I first got the pistol. The TruDots are a fine NS, but I found them lower than I wanted and quite frankly outmatched by the HD’s U-Notch rear sight and hi-viz front sight. 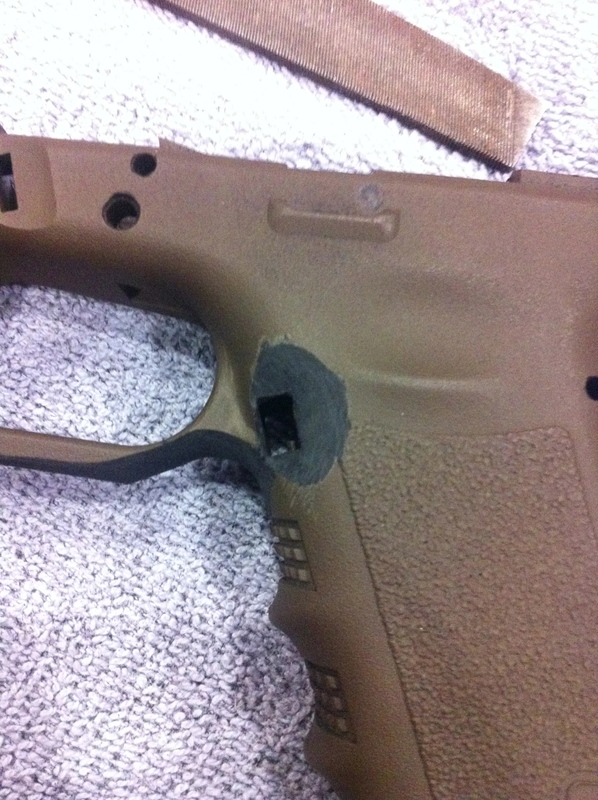 Replaced the full-size Glock smooth-faced trigger with a factory Glock grooved trigger. 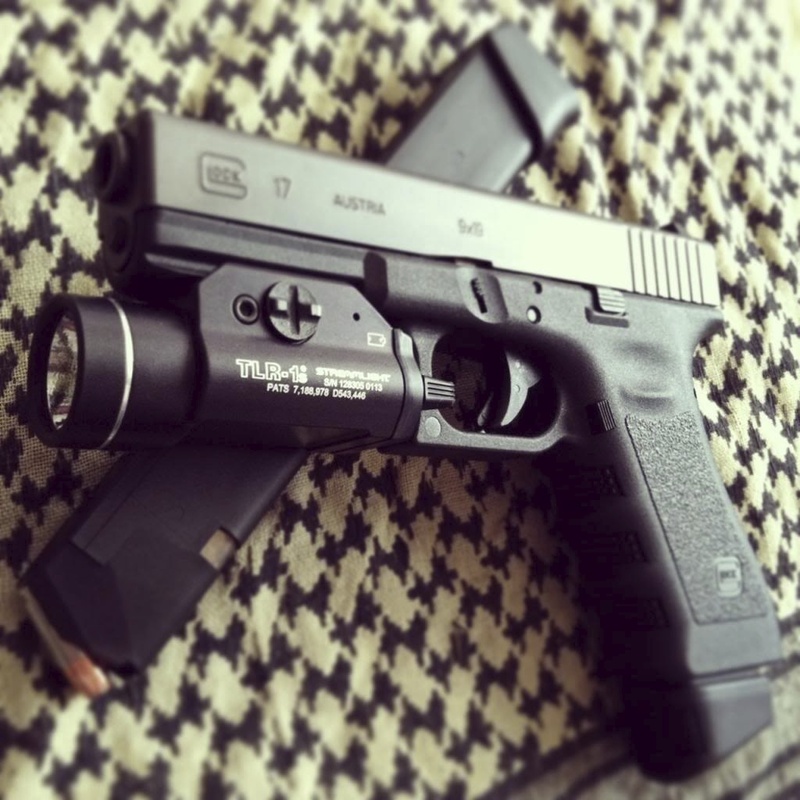 No practical advantage, but I prefer both the look and feel of the grooved trigger, perhaps owing to my first Glock being the G19. 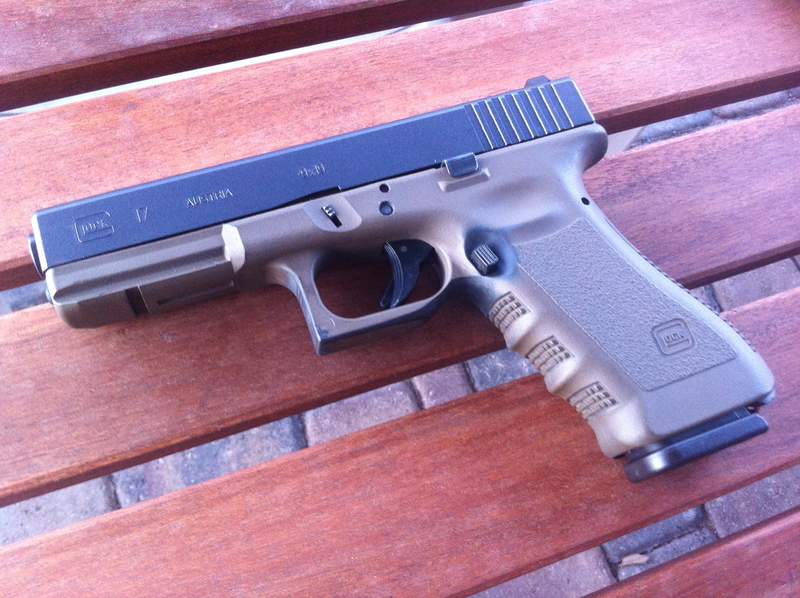 Glock is required by United States law to import pistols shorter than its full-size models with a grooved trigger. There is no real sense to this, but the more hurdles to import a gun the happier the Ban Everything Committee. And me, apparently. 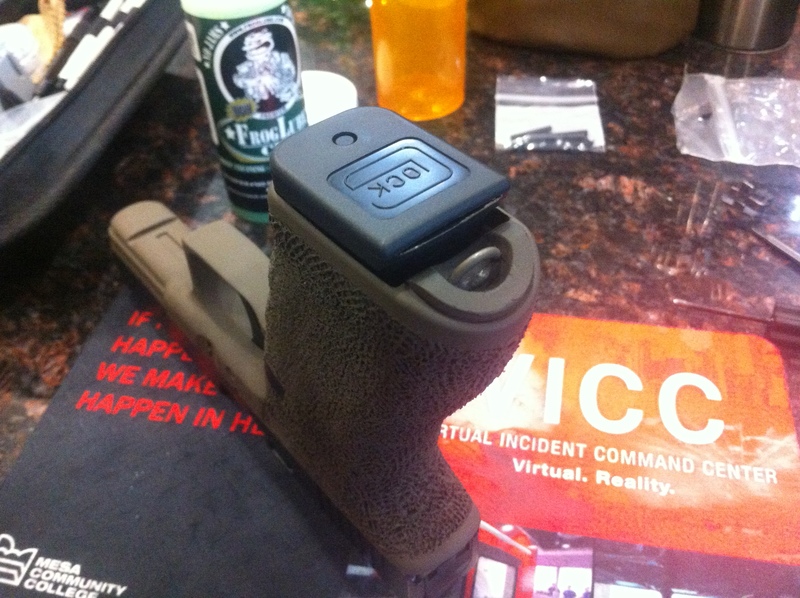 Vickers Tactical extended magazine release (and slide release: now removed) – Vickers mag release is longer than stock, but shorter than the extended mag release Glock offers (which is, I believe, just their large frame model mag release – G20, G21, etc.) that tends to be too long and has a habit of inadvertently leaving your mag lying somewhere behind. I also had a Vickers extended slide release lever installed, which is a great piece of gear, but found that my thumb kept resting on it during shooting, preventing the slide from locking open when the mag empties. Not a good feeling when doing speed drills or – I can only imagine – in combat. 3.5lb Connector and Extra Power Trigger Spring – ZevTech makes the spring, and I couldn’t tell you who makes the connector (perhaps Zev as well?). I don’t generally like tinkering with the internals and I steer clear as much as can be helped, but the 3.5 connector and increased power spring as stand-alones have been a very nice improvement over factory internal settings, reducing the trigger pull to a comfortable, but not absurd, level. Crisp, clean, but still strong, and not a problem yet with several thousand rounds on those parts. In fact I have had less “grit” in the pull while shooting in the desert when things get dirty than with the factory connector. Perhaps it’s placebo, but I’ll stick with it. Lanyard Plug – I forget who makes it, but it’s the only one out there. I enjoy having the lanyard option and having the rear closed up (the arguments for/against this go on for days, and I have no real opinion on the matter save that I like this way better…just because). The downside with this particular part is that the stock screw supplied with it was considerably too short, and required me finding a specialized parts store and then cutting the screw down a bit, damn near cutting my finger in half with a pair of needle nose pliers. Yikes! Still, it hasn’t budged and I like it. Surefire X300Ultra – 500 lumens, long life, clean light, great throw. I had previously rocked a Streamlight TLR-1HL which, at 630 lumens and a strobe feature to boot, is a beast of a light. Still, I found the X300U to have better throw and a cleaner light, and just better lines (I know: not a reason to rock a piece of gear that may save your life one day). Is it worth nearly double the HL? I can’t honestly say it is. I would trust myself to either brand in a pinch. I just prefer the X300U, simple as that. That’s about it for this thing. I have done what I can to keep the pistol as simple as it comes from the factory – it only goes on if it serves a clear, demonstrable purpose. Certainly I haven’t covered everything here, either because I have forgot or it’s unimportant, but there have been a ton of lessons learned with this pistol project. I have done things that have worked well and even better than predicted, and some that I wouldn’t do again; I’ve shown what can be done with $30 in parts and untold hours of labor and thought (oftentimes in that order); and, importantly, I have set a framework for future projects. 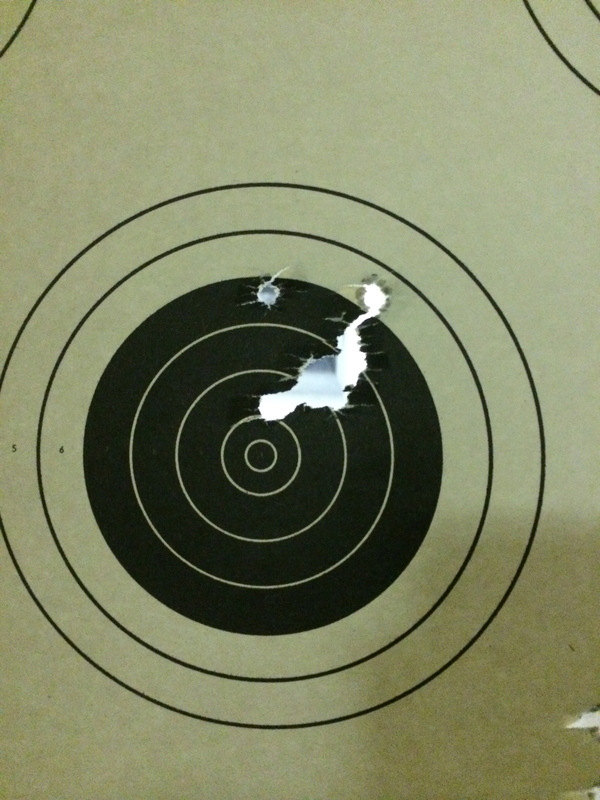 12yds, standing. One flyer. Paper is nice, but steel and shot timers are where the work is. This entry was posted in 2nd Amendment, DIY, EDC, Glock, Guns, Modifications, Private Interests, Shooting and tagged 9mm, EDC, Firearms, G17, Glock, Surefire, X300U by Conspicuous Prejudice. Bookmark the permalink.